WINNING POINTS WITH THE WOMAN IN YOUR LIFE ONE TOUCHDOWN AT A TIME GIVES THE MAN WHO WANTS TO BE A STAR QUARTERBACK IN LOVE "GAME PLANS"...EXPLAINED IN FOOTBALL TERMINOLOGY. As the new star quarterback steps into the stadium for the first time, his body and mind fill with anticipation and apprehension for what lies ahead in the coming season. Will he run or pass? How will he win the most games with the fewest fumbles and penalties so that he's the one on the field come Super Bowl Sunday? The answer boils down to what he's learned from watching, practicing -- and reading the playbook. And much, much more. Peppered with relationship advice from legendary NFL players as well as from Scripture, Winning Points with the Woman in Your Life One Touchdown at a Time enables you to peer inside the female mind and heart so that you can find yourself in a great relationship -- without lost yardage. Jaci Rae is an extra-ordinary woman who never gives up and just won't accept the status quo. As a result of working as a youth counselor in her early years, and her observations and research in psychology, Jaci understood the need to communicate effectively in order to avoid "Getting Benched" (chapter 8). In Winning Points With the Woman in Your Life One Touchdown at a Time, she addresses relational problems for men and women, written in a language that both women and men can understand and enjoy. Jaci's other achievements include several hit singles and award winning discs, with an emphasis on Country. She has won several awards such as the Golden Music Awards' "Female Vocalist of the Year" in Nashville, Tennessee, the Levi Strauss award to name a few as well as mastering several musical instruments and professional photography. She has been on numerous advice panels, and has routinely been a guest writer for various magazines. Her first book, "The Ultimate Guide to Music Success" became itself a success and a reason to continue writing. With one book after another under her belt, she finally "tackled" the difficult subject of relationships. Her upcoming release of, "Cant Push a River" reflects the attitude of her continual "Molly Brown" outlook. Jaci Rae is, after all, an extra-ordinary woman. 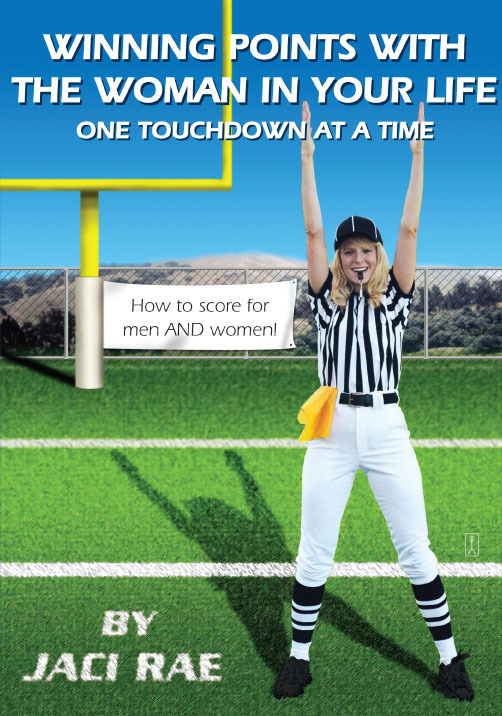 "Winning Points with the Woman in Your Life One Touchdown at a Time is sure to drive football-loving men right into their end zones!...Cleverly using football plays, scrimmage strategies, and tactical maneuvers as analogies, [Rae] shows the male reader how to score big points with their woman." "I found Winning Points to be a very informative and quite descriptive read. It is a wonderful help to those men and women who would like to improve their relationships. The use of football metaphors greatly enhanced the subject matter and made it a fun and easy read that keeps you turning the pages. I truly enjoyed this book and recommend it."